Coaching in Germany // Executive Report 2018 - Deutsche Coaching Geschellschaft e.V. This report provides an overview of the German results from The State of Play in European Coaching & Mentoring (2017) research project, and compares these with the results from Europe and the UK. The research questions were designed by the researchers in collaboration with the EMCC, and were adapted during the development phase. For each country, a research partner or team was identified and a National Research Lead was consulted on whether the survey should be translated, and which language(s) should be used. The National Research Leads led the translation process, which involved initial translation and an independent review. The survey was launched on 1 March 2017 in 31 languages, ranging from English, Spanish, French and German, to Czech, Catalan and Serbian. The survey was publicised through established coaching federations and management bodies, as well as online through social media interest groups. 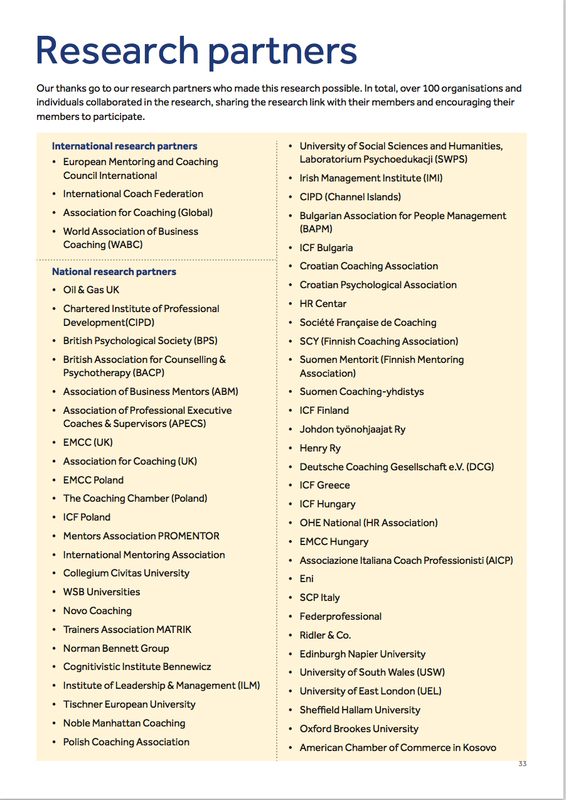 In total, approximately 100 organisations committed to sharing the research link with their members or to publishing details of the research on their website. Participants took, on average, 25 minutes to complete the questionnaire. The first pioneers in Germany practised coaching from 1975 and, as in other countries in Europe, coaching experienced a sharp rise in development during the 1980s and 1990s. In the last decade the market has continuously grown – by about 25% altogether, to approximately €500m per annum. Today, business coaching is a standard method of human resource development in the larger companies, while it is increasingly practised in the medium-sized and smaller ones as well. Most companies have set their own standards for the selection of coaches; nearly all large organisations have built up a coach pool. The number of training providers of coach training has grown too – by approximately 25% over the last decade, reaching about 360 training providers. All of these are more or less the same size. Scientific research has also increased over the last ten years, but it still needs significant further development. The number of German language publications has increased to approximately 2,280 (up by 1,400). These answers show some similarities, mentioning as they do the classical coaching fields of leadership or management behaviour and change management, but they also show differences. The technological revolution that is unfolding is the underlying theme of DBVC’s Coaching Congress 2018. Against the background of the present international study, it is interesting to note that international standards are seen as a hot future topic.